Motorists who have been using detours around the shuttered Delaware River Turnpike Bridge will have to stick it out at least through April. Two weeks ago today, the 1.25-mile bridge was closed after NJTA crews discovered a fracture in a steel truss. Officials have said it will remain closed until the structural component can be repaired. But an April re-opening is a best-case scenario, according a task force of about two dozen public and private engineering design, construction and transportation entities working on the problem. The bride would only re-open that early if a more complex partial reconstruction or possibly even replacement of the bridge is unnecessary. The engineers have been working on several possible repair scenarios; both the PTC and NJTA are hoping the simplest construction method will be effective. "Right now, that best-case scenario entails repairing the I-beam by constructing a permanent splice to reconnect the fractured section," said PTC Chief Engineer Brad Heigel, in the statement. "But before that can occur, crews must first realign the bisected segment by deploying eight temporary towers and hydraulic jacks to return the span to its original position." Due to the truss fracture, a section of the bridge between the two supporting piers dropped by about two inches. Adjoining structural components, not designed to carry a heavier load, nonetheless absorbed the load carried by the cracked I-beam, officials said. That meant the bridge was structurally unsafe. 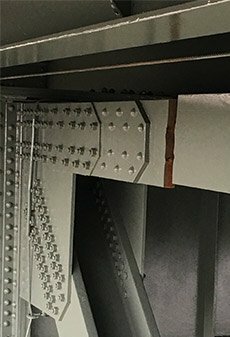 The complete fracture occurred on a 14-inch truss member beneath the driving surface of the Delaware River Turnpike Bridge. The affected truss member is located just below the westbound right lane of I-276 on the west shore. The plan is to construct eight, 80-foot-towers from the ground to support the entire weight of the bridge. Crews have already drilled piles to provide a stable foundation for the towers. When the towers are in place, a new "splice" will be installed and tested, officials said. Data from those sensors during load testing will enable engineers to determine whether a more comprehensive repair is needed. All bets are off on a reopening if the initial repair is not sufficient. “If more extensive repairs would be required, it is not possible to offer even a rough estimate on the scope or duration of further construction because we simply do not have adequate information to make that projection,” Heigel said.